Walt Disney was born in Chicago, Illinois on December 5, 1901 to Elias Disney and Flora Call Disney. He was one of five children. In 1906, Walt's family moved to Marceline, Missouri where his brother Roy had recently purchased a farm. While living in Marceline he developed an interest in drawing. "Doc" Sherwood, a retired doctor and neighbor to the Disney family, paid him to draw pictures of his horse Rupert. The Disney's lived in Marceline for four years and then moved to Kansas City in 1911. It was there that Walt was introduced to the world of vaudeville and motion pictures. In 1917, Walt's father Elias moved his family back to Chicago. In the fall of that year Walt began his freshman year at McKinley High School. In the evenings he would attend night courses at the Chicago Art Institute. He also became a cartoonist for the school newspaper. In 1919 Walt left home and moved back to Kansas City where he began his career as an artist. His brother Roy who worked in the area helped him get a temporary job at the Pesmen-Rubin Art Studio. At the art studio, Disney created advertisments for newspapers, magazines, and movie theaters. It was here that he met cartoonist Ubbe Iwerks. When the Pesmen-Rubin Art Studio closed, Disney and Iwerks were out of a job. They decided to start their own business. 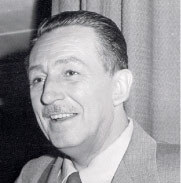 Disney found it necessary to find an additional source of income which led him to find temporary work at Kansas City Film Ad Company. It was there that he was first introduced to animation. Soon after that, Disney decided to open Laugh O'Gram Studio which was his first animation studio. He hired his close friend Ubbe Iwerks and other animators. The studio's cartoons became very popular in the Kansas City area. Disney began setting his sight's on a bigger dream - a studio in Hollywood, California. On Hyperion Avenue in the Silver Lake district, the Disney animation studio was born. While at this location Disney hired a young woman named Lillian Bounds to ink and paint the animation cells. They were married in the same year. They were later blessed with two daughters, Diane and Sharon. In the Spring of 1928 Disney asked Iwerks to come up with ideas for a new character. He tried dogs and cats, a cow and a frog but nothing appealed to Disney. Then on a train ride from Mahattan to Hollywood, Mickey popped out of Walt's mind and onto a drawing pad. Mickey Mouse was born! Well, almost. Mickey was originally "Mortimer Mouse" until Lillian Disney convinced Walt to change his name. His first role as Mickey was in Steamboat Willie. On December 21, 1937, Snow White and the Seven Dwarfs premiered at the Carthay Theater in Los Angeles, California. Their first film now stands as one of the monuments of animation in the motion picture industry. From there the Walt Disney Studios went on to produce many more successful animated classics such as Pinocchio, Fantasia, Dumbo, and Bambi. On December 15, 1966 Walt Disney died of lung cancer. He died before his Walt Disney World Resort in Orlando, Florida opened. His popularity was based on his spirit of imagination and optimism. He became the hero of the common man.